We got a look at the wild fires burning in Texas this afternoon. Wow. One feature stands out today which shouldn’t be there – the plumes of at least five major fires and the haze from many more smaller ones. 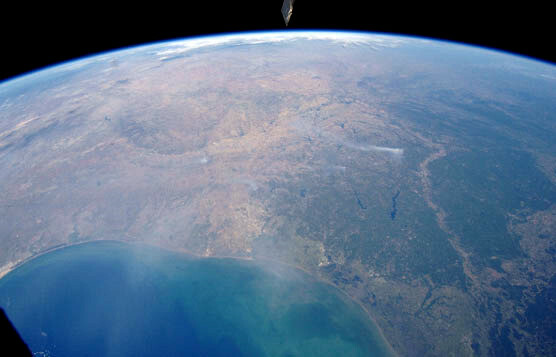 While on orbit, I’ve taken many photographs of fires in New Mexico, Wyoming, Australia, South America, and Africa. Every time I see a smoke plume, I grab a camera and attempt to capture the image with the thought it might be interesting to someone somewhere. When I asked Mission Control for some details on the fires today, they told me Bastrop was the site of one of the largest and confirmed the state park located on the edge of town had been 2/3 consumed along with hundreds of homes in the area and over a thousand across Texas. That was a kick in the gut. This image now elicits a strong emotional response as I realized one of my personal favorite places, Bastrop State Park, was in smoldering ruins and thousands of fellow Texans had just lost everything they owned. Upon further reflection, I realize the park will recover over time, although the forest my Boy Scouts love to run through with map and compass in hand won’t be the same until they visit with their own grandchildren someday. The lost homes are what hurt the most. Our castles. the places where we relax and gather our families and our memories. Have you ever helped someone in the aftermath of a home fire? I have and it is awful. After a flood, you’re dealing with mold and mud with many possessions damaged beyond repair, but you get to hold the soggy photo album and make the decision about trying to salvage a few precious family photos or tossing them in the growing, molding pile. With a home fire, you literally use a rake to go through the pile of ash, cinders and debris in a feeble, almost-hopeless attempt to find a few treasures to clutch tightly as you move on down the path of life. While devastating, these challenges also tend to bring out the best as communities work together to help each other through the tough times. Today the story is about the fires, the heroic efforts to stop the carnage, and the devastating losses. In the weeks and months ahead, listen closely for the thousands of quiet stories of restoration and renewal as we rake through the piles, push the mess aside, and start anew. Better yet, go out there and be part of one of those stories. I’ll see you on down the trail. Thank you for your pictures and your personal reflections regarding the tragic fires in Texas. As a resident of Texas from the Spring Branch area we empathize with our Texas neighbors and pray for the relief of much needed rain. Your pictures and thoughts are appreciated. Thank you so much for your heart felt words in this time of tragedy. As heartbreaking as it is to see friends lose homes, it has been truly beautiful to see the outpouring of support and unity as the community comes together. We know that Bastrop will be better in the end, growing stronger through it’s struggles.